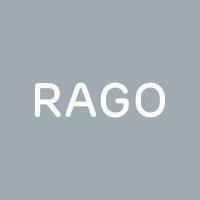 Rago's is the largest and leading auction house in New Jersey. Since 1994, it has served thousands of sellers and buyers with a singular blend of global reach and personal service. One of the top auction houses in the field of 20th century design since its inception, Rago's expertise covers centuries of fine art, decorative arts, furnishings, jewelry, silver, currency and ethnographic property. It is an internationally-known venue through which to buy and sell. It is also a destination for those who seek to learn and share knowledge about art, antiques and collecting, offering free valuations for personal property (from a single piece to collections and estates), appraisals and auction exhibitions in house and online. Attention to consignors is of paramount importance and clients enjoy direct access to partners and experts throughout the valuation, consignment and auction process.